My last outfit at NYFW was simple and sweet. I admire the women who have incredible style and really push the limits. I'd love to have their bold sense of fashion but I'm a bit more simple. This is my ideal outfit--clean and feminine. Since I was attending the J. Crew presentation I felt it was appropriate to wear my new favorite J. Crew skirt (obsessed with all the floral taffeta pieces). I added edgy jewelry to give the look some toughness. I'm so with you -- chic, feminine pieces are always my go-tos! I love this clean, pretty skirt. Wow! That skirt is amazing! I didn't even realize it was floral until I read it. And yeah for simple yet stylish outfits! oh em gee....that color is BEAUTIFUL on you!! I love the subtle print on the skirt as well!! wow! you look amazing! simple outfits are the best ones sometimes :) great skirt! Oh my! I LOVE your skirt!! Beautiful. You look beautiful... love the hair! Enter my giveaway for a sweet little clutch! The floral pencil skirt is quite beauty! 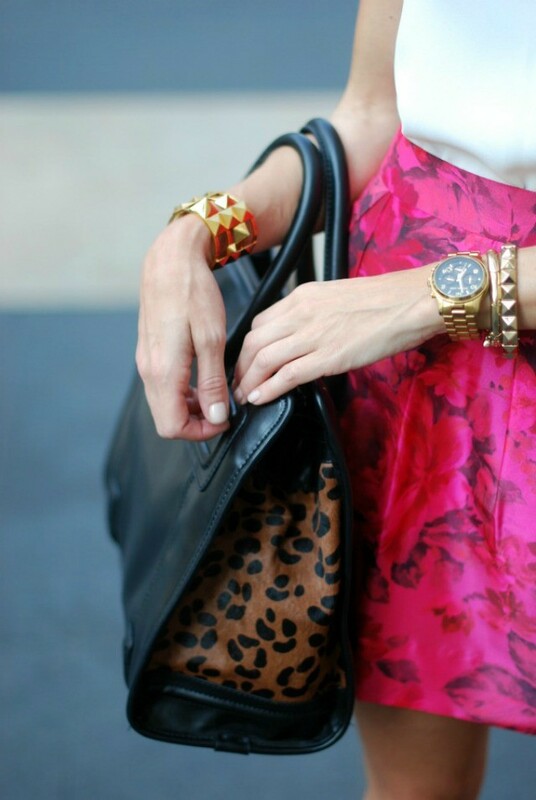 And I can never get enough of that leopard print tote. I have so, so much love for that skirt right now! And I admire your style! You always have the best mix ideas and colors, the accessories here are just perfect, you looked amazing! I like this simple white top, skirt is a lovely!!!! LOVE the skirt! Can see why you are obsessed with it. I love how it's warmed up the past few days in NYC. I still have a few cute outfits I want to wear before Fall weather sets in! Agree with your title- simple and sweet. I love that studded cuff by the way! you look absolutely stunning in this outfit... LOVE that skirt and top and the edgier accessories!! I love it!!!! You're gorgeous!!! I agree, I'd love to have a more daring sense of style, but there's no use being something I'm not. This outfit is perfect. That skirt is beautiful. New York really suits you. It's nice to see you in a city setting. Who took these photos? It is absolutely wonderful. Perfect lighting and composition. I am assuming the bf did not go with you... or if he did that is so awesome and supportive. You have such a great style! love it! Simple and beautiful. What a great look. Gorgeous skirt..and I am with you...simple classic and clean is the way to go! Have loved all of your outfit posts from NYFW. Your use of classic, high-end pieces mixed with trendy items has inspired me to redo my wardrobe. Thanks for posting! gorgeous outfit, that skirt and that bag are so amazing! This is a great outfit. I really like the skirt and the shape of the arm holes on that blouse. You look so gorgeous and classy! love the skirt! I love the crisp lines and the delicate colored skirt...Such a great combination! Definitely something I would wear! That Zara bag is fabulous!! You look gorgeous! Love the skirt and how colorful it is! Your sense of style is absolutely impeccable- effortless & feminine. Great skirt. Love the colors on it... debating on whether or not to get it. Check me out on http://lacouturette.blogspot.com !